Harry V. Carlson was born on January 9, 1921 in Chicago, Illinois to Gustav and Alma (nee Verdelin) Carlson. 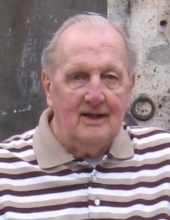 He died Tuesday, February 5, 2019 at Rolling Hills Manor in Zion, Illinois. Mr. Carlson served as a medic in the US Army during World War II in the UK and France. After returning to Chicago following the War, he worked as a butcher and married his beloved wife Evelyn in 1948. That same year, he started Skandia Foods, Inc., a specialty food import and distribution company. Along with his partners, he grew the business in Chicago and Arlington Heights until his retirement in 1986. During his retirement, Harry enjoyed golfing as he was able, spending time with his friends and family, and traveling whenever possible to Florida, Wisconsin, and New England, as well as several trips to Europe. Harry is survived by his brother-in-law, Kenneth (Susan) Bergquist; his nephew Neil (Trina) Bergquist and his great-nephew Henning Bergquist and close family friends Brian, Carolyn, Madison and William Hervat. He was preceded in death by his spouse Evelyn Carlson (nee Bergquist), his parents, and his sister Helen Carlson. Visitation Wednesday, February 13, 2019 from 9:00am until time of Funeral Service at 11:00am at Glueckert Funeral Home Ltd., 1520 N. Arlington Heights Rd. (four blocks south of Palatine Rd. ), Arlington Heights, IL 60004. Interment will be at Ridgewood Cemetery in Des Plaines. In lieu of flowers memorials may be given to Honor Flight, Inc.; Attn: Meredith Rosenbeck; 175 South Tuttle Road; Springfield, OH 45505 (honorflight.org). "Email Address" would like to share the life celebration of Harry V. Carlson. Click on the "link" to go to share a favorite memory or leave a condolence message for the family.